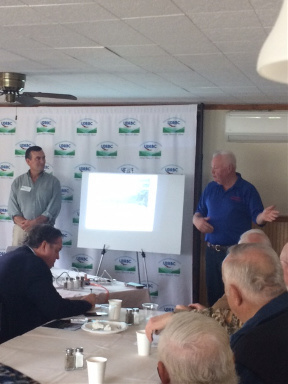 The Upper Delaware River Basin Citizens (UDRBC) held its Spring Seminar, Natural Gas Exploration and Development (NGED) – The Industry Today on May 17th at the Narrowsburg Inn, Narrowsburg, NY. The full day event, where the progress of the industry today and the outlook for natural gas were discussed, featured Tom Murphy, Director of Penn State’s Marcellus Center for Outreach and Research, Bill desRosiers, External Affairs Coordinator for Cabot Oil & Gas Corporation and Tom Shepstone, Owner of Shepstone Management Company, Inc. Speaking to a packed venue, State Representative Jonathan Fritz (R-111th) opened the seminar with his expert analysis regarding the evolution of the multibillion dollar natural gas industry in Pennsylvania, the success in Harrisburg with H.R. 515 and the upcoming hearings of the House State Government Committee, which will finally expose the overreach of the Delaware River Basin Commission (DRBC) to the public. The venue was filled with land owners and officials from the region, including Brian Smith, Chairman of the Wayne County Board of Commissioners, who shared his perspective on this issue and expressed the need to have access to this economic engine, which will be a tremendous boost not just for agricultural related industries, but the economy of the region. Sessions included Regional and Global Impacts from Shale, Perspectives on Regional Shale Development and Legal/Political Implications concerning Shale. The event concluded with UDRBC President Ned Lang thanking the speakers, officials and thousands of UDRBC supporters across the Upper Delaware River Basin. A special thank you went to Alison Foster Brown and the staff of the Narrowsburg Inn, whose tremendous efforts after the storm allowed the event to happen as scheduled. The UDRBC maintains that NGED, balanced with existing and planned renewable energy systems in the NE Basin, will create the dynamic infrastructure needed for new economic opportunities for the residents, communities and businesses in Wayne and Pike Counties. The UDRBC Seminar/Special Event Series, focused on key issues important to the Upper Delaware Basin, will feature spring and fall opportunities for public education.